Today, please… preserve your sanity. And whatever remaining faith you have in humanity. Shop from home. Amazon: You can find all kinds of geek goodness at Amazon’s Black Friday sale. DVD and Blu-ray deals, including new releases for under $10 and hits for $1.99. 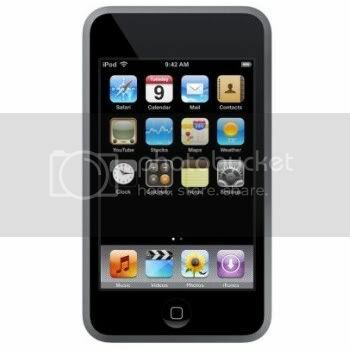 Apple iPod touch 16 GB for $199.99, which is 70 bucks off of yesterday’s price. Plus, deals on toys, electronics, and more. Random Geekery: At ThinkGeek, you can get $5 off $25+ orders and $10 off $50+ orders with code “BRAINS“. Comics and Collectibles: Things from Another World has 30 to 50% off “doorbuster” items for its Black Friday sale, plus 25% off hundreds of statues and collectibles and designer vinyl toys for the rest of the year. Computers, Gadgets, and Electronics: Up to 80% off at Geeks.com, plus $1.99 shipping on all orders $49.99+ with code “SAVEMONEY“. Plus, save 10% off anything not marked “special” with code “MCEXCLUSIVES“. UPDATE! Star Wars Swag: 10% off everything in stock in the official Star Wars Shop during their Black Friday sale.